The New York Times #1 Best Seller Returns! This November, the lightning returns. 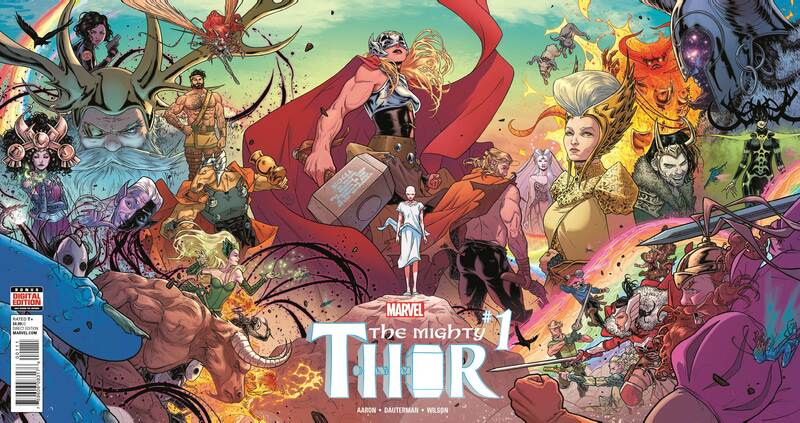 Today, Marvel is pleased to present your new look at THE MIGHTY THOR #1 – the new ongoing series from blockbuster creators Jason Aaron and Russell Dauterman! Now is your chance to jump on-board the popular storyline of the new Thor as it charges headlong into the All-New, All-Different Marvel Universe! Her identity has finally been revealed as Dr. Jane Foster. When she lifts the mystic hammer Mjolnir, she is transformed into the Goddess of Thunder, the Mighty Thor! Eight months have passed since the end of Secret Wars – her enemies are many, and they are everywhere. As Asgard descends further into chaos, war begins toBring The Thunder – Your First Look at THE MIGHTY THOR #1!spread throughout the Ten Realms. Yet her greatest battle will be against a more personal and deadly foe – the cancer that is killing her mortal form. Be there as her story begins anew this November in THE MIGHTY THOR #1!